The exhibition showcases a number of historically-significant books and informative panels. Charlene Vella reviews The Bibliotheca Melitensis: A Passage Through Time, an exhibition celebrating the national library’s 200th anniversary. The history of the Bibliotheca building, which houses the National Library of Malta, is as fascinating as its architecture is remarkable. And I am glad that an effort is being made to shed light on the historical importance of this magnificent regal building: one of Valletta’s finest. The foundations were laid in 1776, under the enlightened magistracy of Emmanuel de Rohan, one of the most artistically quickened and learned of the Grand Masters. A new building was needed to replace the old library building known as the Forfantone (located in the corner of Republic Street and St Lucy Street, Valletta). The choice of architect was an inspired one. Stefano Ittar, a sophisticated architect of Polish extraction, whose family had moved south to the Kingdom of the Two Sicilies, produced a building that reflected the artistic preoccupations of the Age of Enlightenment. He had already achieved fame in Sicily, but the Bibliotheca was his masterpiece. The Bibliotheca dominates and gives character and dignity to one of the city’s most important open spaces, the Piazza Regina, which is in many ways a public drawing room, or to use a Maltese expression, a ‘salott’, known and loved for its cafes, and as a leading people-watching spot. But what a shame it is to find out that not many who habitually frequent the piazza have never ventured into the building, or even stopped to look at its noble architecture. This is one of the last buildings built by the Knights of St John in Valletta. It was completed in 1796, only two years before the Order was expelled from the islands by the French Army that was on its way to Egypt under that great military genius, soon Emperor, Napoleon Bonaparte. Thankfully, the Bibliotheca was spared serious damage. It fell to the British, Civil Commissioner Sir Hildebrand Oakes, to inaugurate it as Malta’s National Library (and Cabinet of Antiquities) in 1812. The day chosen was the official birthday of King George III, June 4. During the long British period, the Bibliotheca was known as the Royal Malta Library. It continued to be Malta’s major public library until 1976 when the Floriana Public Library was set up. Today the Bibliotheca is the focal point for scholars and researchers. It houses Malta’s most important archives, including those of the Knights of St John, which draw the attention of historians and scholars worldwide. 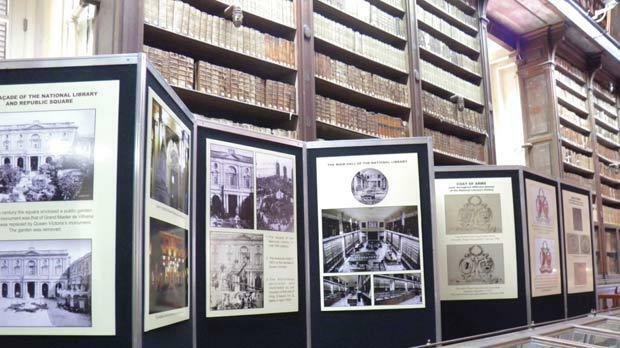 To honour the 200th anniversary of the building’s inauguration, an exhibition has been set up and is located in the entrance to the awe-inspiring reading room. The exhibition showcases a number of historically-significant books and informative panels. It highlights many facets of the fascinating history of the building and its collection. The history of the collection is traced back to 1555, when Grand Master Fra Claude de la Sengle decreed that all books that belonged to deceased knights of the Order of St John were to be deposited in the Common Treasury of the Order. The first library was housed in a room above the oratory of St John’s Conventual Church before being moved to Forfantone house. By the late 1770s, the library’s collection consisted mainly of books that had belonged to Fra Louis Guérin de Tencin, Bailiff Grand Cross of the Order who had died in 1766. The most important core was the collection of Cardinal Joaquin Portocarrero, which de Tencin had purchased in 1760 on the Cardinal’s death. De Tencin features prominently in this exhibition, and justly so because he is in many ways the true founder of the library. As a matter of fact, for a long time after his death, it was known as the Bibliotheca Tanseana in his honour. Original archival references to important historical events are exhibited in their original form. The exhibits are many and varied and are set up in chronological order. I was delighted to see among the book exhibits works by Athanasius Kircher (1601/2-1680) that are being restored thanks to Lions Club Sliema. Most important among them is Kircher’s Mundus Subterraneus (1664), which vividly relates his experience of the Maltese troglodytes at Għar il-Kbir. This is just one of many historically important books showcased in this exhibition. Foremost among the other exhibits is the 1426 illuminated manuscript on the life of St Anthony Abbot. There is also a selection of other publications that include exhibition catalogues related to the library, old library catalogues and old photographs of the Bibliotheca, which include a charming one of the façade with Café Royal to the right. There are also books on Stefano Ittar, and commemorative stamps issued on the 200th anniversary of the building’s inauguration. The panels highlight the intensive restoration programme the building has been undergoing, and its history is well mapped out using text and several illustrations. The unique art historical importance of the Bibliotheca will multiply itself when visiting this exhibition. The Bibliotheca Melitensis: A Passage Through Time is open until Thursday at the National Library of Malta between 8.30 a.m. and 1 p.m (Saturday 8.30 a.m. to noon).